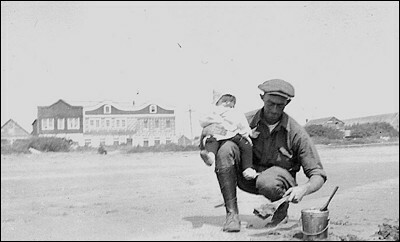 My grandfather Frederick Armstrong Daugherty with my mother Fredene digging clams for a clam chowder lunch. They are on the beach near Crescent City, California in August, 1922. Mom is 11 months old. Most of the buildings shown in the background were destroyed in the 1964 tsunami.